The Spotted Mandarin, also referred to as the Spotted Mandarinfish, Psychedelic Mandarinfish, Psychedelic Fish, or Picture Dragonet, was first found in the Western Pacific Ocean in 1976 by Peters. 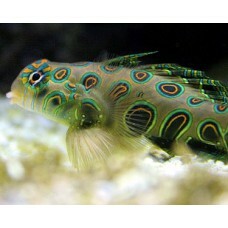 The head, fins, and body are a psychedelic combination of blue, orange, and black spots on a green base. Males may be distinguished from females by their more-elongated first dorsal spine. It requires a 30 gallon or larger aquarium with live substrate and plenty of hiding places. It is moderately hardy in reef aquariums if given special care. It is not overly aggressive towards other fish, except for conspecifics.